Renault approach the 2019 season intent on maintaining their march towards Formula One’s top three teams aided by the arrival of Daniel Ricciardo to drive alongside Nico Hulkenberg. 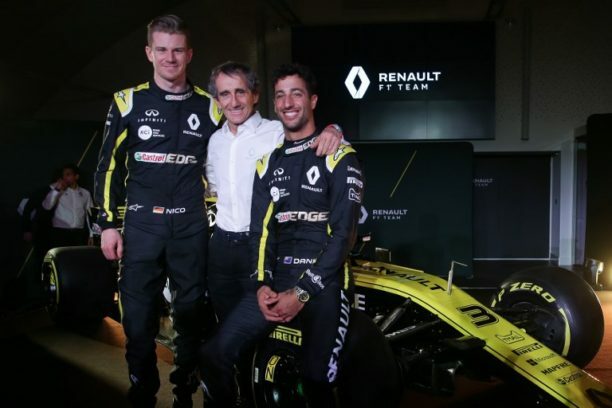 “We are starting our campaign with the aim of continuing this momentum,” said Renault’s managing director Cyril Abiteboul at the team’s 2019 launch on Tuesday at their Enstone headquarters in England. Ninth in the constructors’ title race on their return as a team to F1 in 2016, they improved to sixth in 2017 and fourth last season. Unveiling the black and yellow RS19 they are counting on to close the gap on Mercedes, Ferrari and Ricciardo’s former employers Red Bull, Abiteboul said they had avoided setting a points target. A seven-time Grand Prix winner, Ricciardo’s arrival should help Renault continue their upwardly mobile trajectory. “The added momentum of the Daniel-Nico partnership brings confidence to the team this season,” said Abiteboul. “I believe we have one of the strongest – if not the strongest – driver line-up on the grid. Daniel brings proven race winning experience and knowledge of a top team, while Nico is hungry. Ricciardo’s professionalism and sunny disposition should also benefit the team. “I want to put a spring in everyone’s step because that’s part of my job and also my character,” the Australian said.